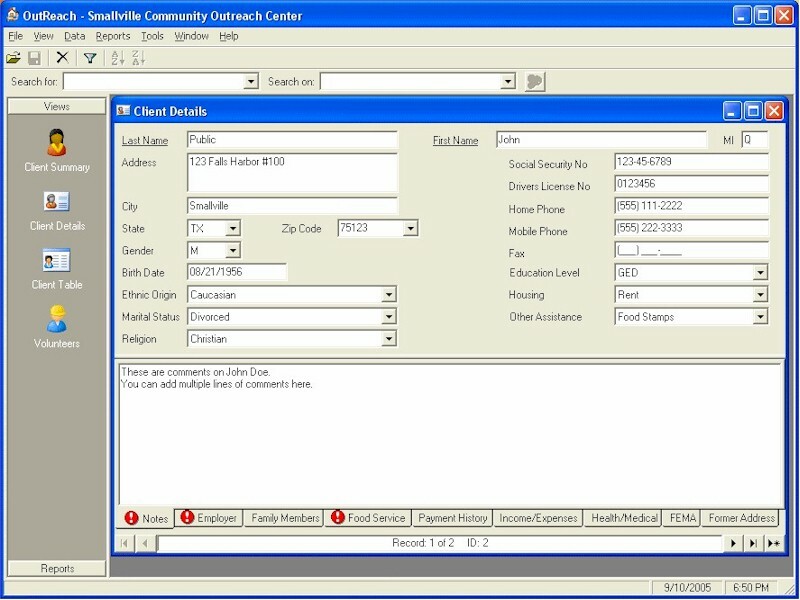 OutReach Community Assistance Database is a client database designed to be used by charitable organizations who provide financial and material assistance to their communities. With OutReach, you can record and manage information on your clients and volunteers, track assistance provided, generate reports, print address labels, and more! User-defined tables allow for easy customization for many data fields and prevent typing mistakes. ...... address, phone, marital status, birth date, ethnic origin, social security number, drivers license number, education level, housing type, and employment information. * Store information on client family members. * Track client grocery/food assistance history. * Track client financial assistance history. * Track client monthly income and expenses. * Summary, detail, and tabular views available for all client data. * Record information on volunteers to your organization. * User-defined tables allow for easy customization for many data fields and prevent typing mistakes. * Export client or volunteer data to a file for import into another application, such as Microsoft Excel. * Powerful filtering capabilities allow you to filter client data by almost any field or combination of fields. * Print client address or name labels. * Attach a document to a client or volunteer record. Qweas is providing links to OutReach Community Assistance Database 1.5.2 as a courtesy, and makes no representations regarding OutReach Community Assistance Database or any other applications or any information related thereto. Any questions, complaints or claims regarding this application OutReach Community Assistance Database 1.5.2 must be directed to the appropriate software vendor. You may click the publisher link of OutReach Community Assistance Database on the top of this page to get more details about the vendor.